Plymouth, MA.... Popular Low-Profile BeCu gaskets from Tech-Etch are offered in Stick-on, Hook & Stick-on and Clip-on mounting configurations. With EMI/RFI shielding effectiveness over 100db attenuation, the gaskets have free heights from .06" to .15" high and will close gaps from .030" up to .120". Stick-on mounting provides a fast, reliable installation that may be used at ambient temperatures from 67°F to 300°F. One side of the Hook & Stick-on gasket fits over the flange to provide additional mechanical security. All these smooth-to-the-touch gaskets are ideal for bi-directional applications, require only a low closing force and provide continual snag-free operation. 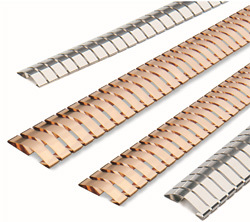 An optional DiamondBack (dB) textured surface for high frequency applications is also available. A variety of metal thicknesses are offered, including some profiles offered with thick and thin options as well as stainless steel, to provide the best match for the compression requirements of the application. Free samples of the low-profile, no-snag gaskets are available at www.tech-etch.com/shield/shieldlit.html. A global leader in shielding technology, Tech-Etch, Inc. manufactures a complete line of standard and custom shielding products for both the commercial and military markets. Visit the web site at www.tech-etch.com/shield to download their 52-page interactive Shielding Catalog in PDF form.